In a pot or large saucepan, heat the olive oil over medium heat. Add the chopped onion, green pepper, cumin and oregano, and cook, stirring, for 6 minutes. Add the garlic and stir for 2 more minutes. Add the black beans and stir for 1 more minute, then remove from heat. Add the rice and water to your rice cooker (if your rice cooker has a water line for white or brown rice, just fill with water up to that line. Otherwise, just add approximately 3 1/2 to 4 cups water. 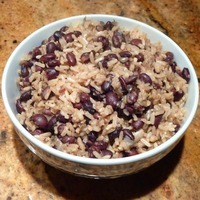 Then, using a spatula, move the bean mixture from the pot into the rice cooker pan on top of the rice and water. Mix thoroughly. Cook the rice on the normal setting and serve when completed. This is a simple, healthy, and tasty alternative to a regular rice side. It goes well with any grilled meat, and with this easy recipe it's not much more work than making rice in a rice cooker. Awesome recipes you have. Thanks for sharing this. its very healthy and awesome!! If you don't have a rice cooker, what is an alternative way to prepare this dish? I also enjoy good Cuban food and would love to make this. Hi Bon - great question. Please follow the same directions using a covered pot on the stove. Bring the rice to a boil, then reduce heat to a low simmer an cook for about 30 minutes. Check the rice at 25 minutes to see if there are small holes in the surface. If so, it is done. If not, put the cover back on and cook a little longer. It should definitely not take longer than 40 minutes. Enjoy!